Shisaku posts normally contain at least two or three typos, due to my own unfortunate haste and the reality that this is a private sharing of information and opinion. Which is what makes today's featured Huffington Post post on Japan so very special. Click on image to open in a new, larger window. The author of the blog post, Dr. Peter Navarro, is a professor at the University of California, Irvine (I am not making this up). His personal website directs you to to his documentary site, deathbychina.com, where, among other things, one can download a free copy of the "Death by China" theme song (I am not making this up, either). Of special note is the author's having the prime minister visiting the "Yasukuni Shin" -- which, one must assume, is somewhere in between the Yasukuni Foot and the Yasukuni Knee. For the record, Abe Shinzo is a Shinto chauvinist, meaning that he not only publicly participates in Shinto rituals whilst in the dress of a public official, but he is leader or significant member of a number of political organizations aiming to promote a politico-social role for Shinto. Abe is the chairman of the Shinto Political Alliance Diet Member's Roundtable (Shinto seiji renmei kokkai giin kondankai), the Diet arm of the Shinto Political Alliance (Shinto seiji renmei, or Shinseiren - Link - J), an organization established in 1966 to combat, according to the organization's website, the spirit postwar materialism and the accelerating loss of memory of what is Japanese and what it means to be a Japanese. Abe is also the chairman of Japan's Rebirth (Sosei Nippon), an organization recently featured here. Japan's Rebirth seeks a reawakening of the pride of the Japanese people in their history and culture, with a special focus of the Imperial House. Given the prominence of the thought of Yoshida Shoin in the organization's literature (Yoshida's spirit being, in Prime Minister Abe's life, a focus of special reverence) and given the special mention in the group's guiding principles to a fight against permanent residents receiving the right to vote in local elections (Abe and I, a holder of permanent residence, are in complete agreement as regards the idiocy of such proposals) Sosei Nippon should be seen as a rinsed and limp version of the 19th century's sonno joi ("Revere the Emperor/Expel the Barbarian") movement. As such, Shinto, particularly a version of State Shinto, is definitely in the Japan's Rebirth tool set. Abe has always been a prominent member, of course, of the Association of Diet Members for Worshiping at Yasukuni Shrine Together (Minna de Yasukuni jinja ni sanpai suru giin no kai) which organizes the Yasukuni mass visits of Diet members and advocates a a normalization of Yasukuni to the point where Cabinet members and the Emperor pay regular official visits to the shrine. 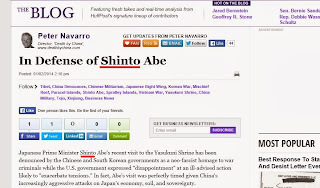 So yes, Professor Navarro, there is a "Shinto Abe" -- but only in spirit, not name. Thanks for another illuminating post. I'm curious as to why you are against granting permanent residents of Japan the right to vote in local elections. Do you view such a proposal as "insufferable nonsense," as a Daily Yomiuri editorial so memorable put it a while back? Citizenship in a democracy is indissolubly linked to the ability to choose one's representatives in government. If non-citizens can vote in public elections, citizenship becomes an entitlement category. The "we pay the taxes, we obey the laws" argument just does not cut it. Abe could at least find common ground with U.S. Christian conservatives in postulating an essentialist argument about the the religious underpinnings to the founding of their respective states. MTC reads the Huffington Post so I don't have to. Thank you for your selfless public service! Yes Abe could find common ground, but could American Christian zealots accept it? 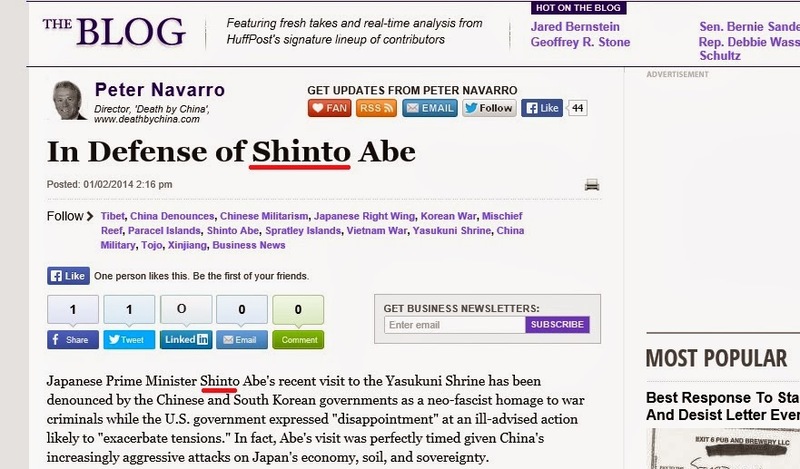 Shinto is not universalist, so it's OK for Abe and his folks to accept that US barbarians practice other religions. But the Scriptures prescribe death for idolatry, so the Christian agitators in the US are bound by their faith to either convert or terminate those who reject their beliefs. Thanks for your reply, Michael. That's an interesting argument about what citizenship in a democracy entails. But I don't quite follow your point about how allowing non-citiizens to vote in public elections makes citizenship an "entitlement category." Based on my understanding of the term "entitlement," one could say that as a citizen of a democratic country one is "entitled" to vote in that country's elections. Or would you argue that citizenship in a democracy carries with it an inherent right to vote, as opposed to a mere "entitlement"? I think part of the problem here stems from the basic concept of citizenship. What does it mean in a world where expatriates such as ourselves spend long periods living in countries other than the ones where we have citizenship? I have been disenfranchised by my county, Canada, because I have been a non-resident of that fair land too long. So now I can't vote anywhere. Is that fair? I suppose it could be argued that is simply my choice, and that the broader interests of the Japanese and Canadian polities outweigh my individual problem, but I don't like it, all the same.